Permanent FingerPrints For Your Car! 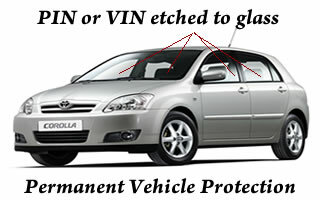 The etching of windows on a car has been widely endorsed by the FBI, National Crime Bureau, and many Law Enforcement Departments across the US. A Travelers Insurance Company study of 7,600 etched cars showed a 64% drop in theft, and an increased recovery rate from 33% (for un-etched vehicles) to 85%. Developed solely for agents and dealers, DotGuard Etch allows the windows of a car to be quickly and effectively etched using an easy chemical etching process thus ensuring the windows are marked for lasting protection. The DotGuard etch program can be completely customized to suit your exact needs and the etch stencils arrive in your dealership pre-coded and ready for immediate application. In addition to customized vehicle parts marking programs, DotGuard can also assist with promotional products and gift with purchase ideas. Give your customers the gift that keeps on giving for years to come. Sample customized gift with purchase kits. Please contact us for more details and pricing on label orders.